At the Job Settings step of the wizard, define replication job settings. From the Repository for replica metadata list, select a backup repository that is located in the source site. This backup repository will be used to store metadata for VM replicas — checksums of read data blocks required to streamline incremental sessions of the replication job. In the Replica name suffix field, enter a suffix for the name of VM replicas. To register a VM replica on the target host, Veeam Backup & Replication appends the specified suffix to the name of the source VMs. Files of the VM replica are placed to the VMname_suffix folder on the selected datastore. In the Restore points to keep field, specify the number of restore points that must be maintained by the replication job. If this number is exceeded, the earliest restore point will be removed. Due to VMware restrictions on the number of VM snapshots, the maximum number of restore points for VM replicas is limited to 28. When you specify the retention policy settings for the replication job, consider available space on the target datastore. A great number of restore points (snapshots) may fill the target datastore. You cannot store VM replica metadata on deduplicating storage appliances. 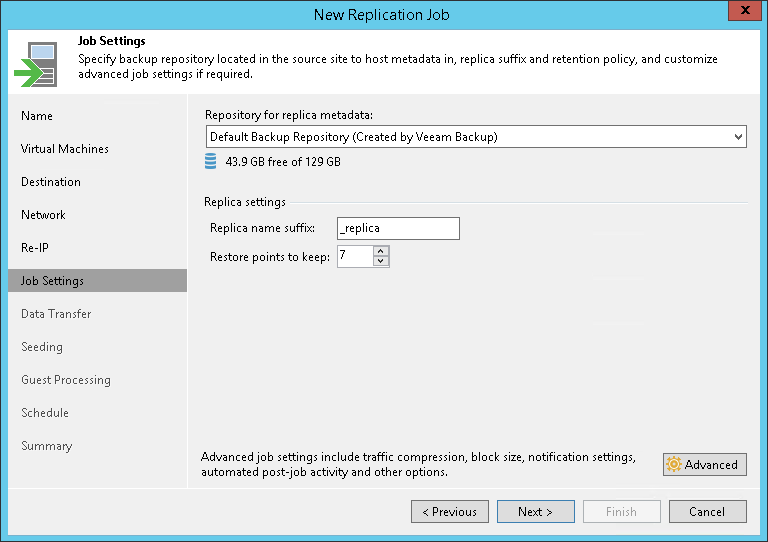 During replication jobs, Veeam Backup & Replication frequently reads and writes small portions of metadata from/to the backup repository. Frequent access to metadata causes low performance of deduplicating storage appliances, which may result in low performance of replication jobs. You cannot store replica metadata on a scale-out backup repository.